Squeefinity: A Casual Guide to Anime and Manga: Winchester Wednesday? Oh, man, I'm so sorry to have missed Tuesday's Ta Ta post. I have been caught up in a little Supernatural time loop and have not been thinking so much about lady parts. We are the Winchesters, and we will you to think very hard about guy parts. If you know me, you know I am like a obsessed and rabid dog when it comes to series. 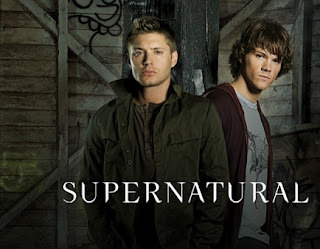 I finally decided to start Supernatural, and apparently cannot stop or function until I am done watching all of it, and by all, I have decided the first five seasons. I enjoy the show, but will stop shy of writing fan fiction like a certain person named James Parker Lombard who I happen to have the pleasure of knowing, and you would be lucky to know this person, too. In the meanwhile, I will direct you to my earlier post on knockers in Blue Exorcist, which I have big plans to catch up with this week. Just a little more Winchesterness first. I am all for Winchester Wednesday...ALL FOR IT! I'll tell James you pimped him. He's a fool. An obsessed fool! Man, the number of run on sentences in my post are disturbing. So much for being the bard when one is tired. Of course the Winchesters make one think of guy parts. Once you watch season 6 you can read my completely wincest free fanfic, Ms. Shakespeare. You are both lucky to know me. Try not to fall in love, okay?